We foster cats and catlings. "Wait. What?" I hear you say. Just give me a few moments to explain. 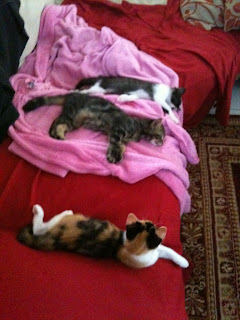 Over the last year Ben and I have been fostering sick cats, mothers with kittens and the like. And, like 2 year olds, you have to watch them like a hawk. They are always being mischevious, investigative and learning about the world they are in. Since they are often sick or just kittens, we have to keep them inside for their own safety. So they learn about the world that is the our house. You can't concentrate on much, read a book and so on. Some things you can do includes watching TV. And I've been watching debates about the existence and nature of god while keeping a watchful eye on the fuzz balls. So while you listen to Dawkins, Krause, Lennox et al, you observe the cats, their habits, their kittie-language and so on. One thing that leaps out is the solid block that is the limit to their intelligence. They can jump on chairs without knowing that it is a chair. They eat food from a mechanical food chain beyond their grasp. They cathramorphise us as their parent cats. They may watch TV sometimes but have no capability of understanding any of the massive technological edifice behind those flickering images. Build a car or fly a jet fighter within any reasonable time span. So when I see a bunch of atheists, theists and deists debating I get an image in my head. And that image is a bunch of house cats, sitting on a carpet discussing the nature of Dog. I'm not saying that the debates are pointless and shouldn't be done. They should continue, but on the understanding that a hundred years from now they will be debating the same thing. So I'm laying off the debates for a while.